Painting by Ron Schaefer of Tuthilltown Art Gallery, Gardiner, NY. About Town was founded in 1984 by Liz Weisz, Elena Erber, Karen Thompson, and Vivian Yess Wadlin. Stories from 2001 to the current issue are in the archives. As we closed the books on Winter 2018-2019, ending our 35th year, we take the opportunity to look back on some of our favorite stories from earlier issues. This summer, I will take my grandchildren over Perrine’s Bridge. I think of the journey across the wandering Wallkill River as an inter-generational sharing, a tradition I can not break. Often, my father and I would stop, abandon our car, and walk within the bridge’s seemingly indestructible timbers. At the Route 213 end of Perrine’s Bridge, cars and trucks sail past at 45 miles an hour. Not far from us the traffic on Route 32 is cautioned to proceed at no more than 55. Closer still, the New York State Thruway traffic whizzes by above our heads at 65+ miles an hour. My father always reminded me that the speed limit sign was missing from the bridge. Not because he thought I didn’t remember, but because it immediately settled us back into the right era for the structure. The missing sign had warned all not to proceed at more than five miles an hour. Today, of course, you can only walk on it–cars were prohibited in 1930–the horse and wagon are even longer absent. The bridge had already carried and shaped our personal and industrial history for more than 80 years. The first travelers crossed Perrine’s Bridge in 1844, one and a half centuries before my grandchildren will walk on it. Twenty years before the end of the Civil War. Sixty-eight years after we became a country. Test borings by Paul Huth in bridge repair-scrap suggest the trees used in the bridge were seedlings in the mid-1660s. I imagine the oaths sworn, the deals made, the kisses stolen, the truths told and hidden away within the confines of its time-darkened About Town chamber. At least one kiss is documented for eternity. In a 1997 article by Erin Quinn in The Herald, we learn, “It was on that bridge that my grandmother received her first kiss from my grandfather before they were married.” It is ever a romantic place. When Benjamin E. Wood (is that a perfect name?) built the bridge crossing between Perrinesville and Tillson, it cost about $2,200. Its 1997 restoration price tag was $195,000. 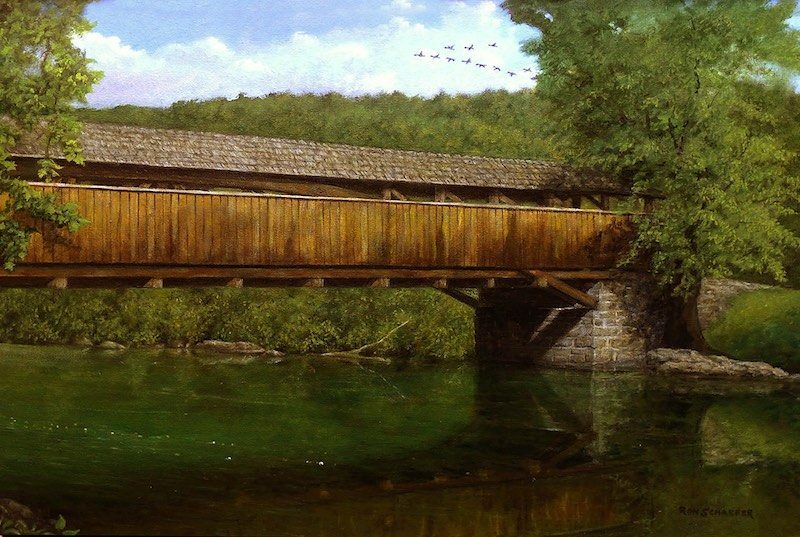 Wood’s graceful Burr-arch design is the last of its ilk and is reputed to be the second oldest surviving covered bridge in New York State. It is believed Wood built his bridge in the winter using the ice as a staging area. The structure was assembled on the ice and then raised into place. Cement from nearby Rosendale and bluestone from local quarries combine for the bridge’s foundations and were probably completed earlier in warmer weather. The structure is a single 138-foot span, with an outside width of 20 feet. Inside it is 16’6” high and 12′ wide, handily accommodating the hay wagons of its day. But much more than hay moved through this once highly industrialized neighborhood. The falls nearby hosted a number of operations requiring waterpower. The J.W. Dimmick & Co. carpet and woolen mills, among other products, supplied blankets to warm Civil War soldiers. Later, the same mill was used by the Kaye Brothers to produce knives. Thomas Butler founded a cotton mill near the Dashville Falls, site of the Central Hudson dam and power plant, a quarter mile downstream from Perrine’s Bridge. There was also a sawmill and a gristmill. All this milling and weaving meant a lot of cargo was coming and going through Perrine’s Bridge. Benjamin Wood died at the age of 57 and is buried in the Freer Burial Ground, south of his bridge. Wood was a descended from the Huguenots, and his home eventually became the Oscar Tschirky farm (the famous maitre d’ Oscar of the Waldorf Astoria–creator of Waldorf Salad) and is now the Culinarian Home Foundation. The Culinarian Foundation and the nearby Society of Brothers of the Bruderhof have been instrumental in the upkeep of the bridge. 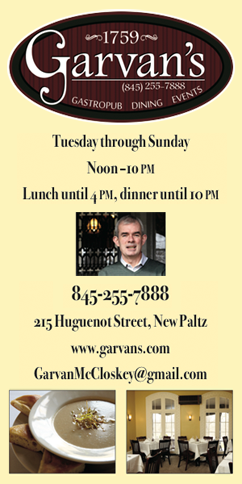 James Perrine, a French immigrant, had established a tavern near the Wallkill around 1820. And although I think it should have been Wood’s Bridge, it is named Perrine’s. After the bridge was built, Perrine’s son was hired each winter as the “snower”-one who spreads snow the length of the structure so horse-drawn sleighs could cross. In 1930, the bridge was closed to traffic and declared a historic landmark. The NYS Thruway authority wanted to tear it down, but fortunately, residents obstructed that plan, and the bridge was given to me, my grandchildren, you, and all who come after us. We are ever grateful to them, and to all who keep it safe.